Simple, this song resumes how businessmen like me and many millions more, must be today. Harder: in your business you must harder, in many senses, harder against your competitors, harder in selecting customers; leave the ones that aren’t giving you good business in comparison to the hours spent “chasing” them. Harder in expressing your ideas; is better to show things clearly avoiding unpleasant misunderstanding that can compromise your job. Harder taking your decisions, I know that what I’m going to say is not so easy to accept but in your organization you should know who can be your trustable partner and if someone is not convincing you in terms of performances, give him/her some chances but at the end you must tell them to leave. Better: Today everything must be done better. The market is requesting you best in class performances, continuous improvement. You need better products, better processes, better strategies and better partners. You must look for your key differentiators in order to show that you are better than others! So, still thinking that this song doesn’t fit perfectly? Faster: If you are an entrepreneur or a manager you know that time is another element. You must be faster than competitors. Not just in term of products to be launched in the market but you must be faster in taking strategic decisions, be analytic, extremely analytic, be a faster filter of all those elements that are conducting you in some never-ending decisional processes. I know that is not so easy be fast especially when some decisions can hide big risks, but unfortunately I experienced many times that to be successful in your business you must react very quickly. 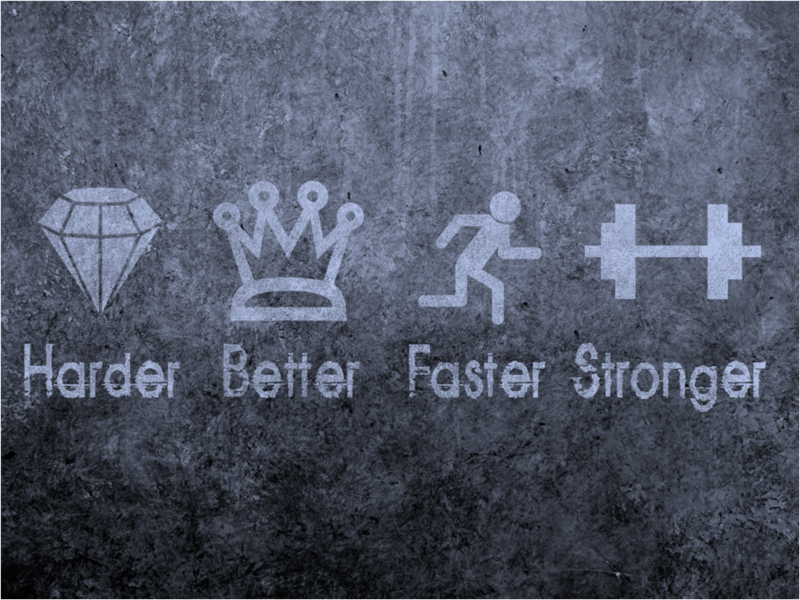 Stronger: You don’t need just to be harder, better and faster, you need to be stronger too. Why? Because only people very strong can support the stress caused by such a though business environment. You need to be stronger in your daily routine; be able to work hard and dedicate time to your family too. Stronger to fight tiredness, I’m working almost 15 hours a day with different customers and I must say that sometimes is not easy. If I shouldn’t be stronger than some years ago when I was working as an employee, today I couldn’t face this incredible economic crisis. So , Thanks Daft Punk, really well done!